While past GBM research has focused on chemotherapy, scientists have switched their focus to therapy utilizing the body’s own immune system to create tumor-fighting vaccines. Two upcoming phase 1 trials at Penn State Hershey, ICT-121 and WT2725, target cancer stem cells traditionally resistant to any form of treatment. In the ICT-121 clinical trial, patients voluntarily undergo apheresis, using their own blood to create autologous dendritic cells, which are mixed with two tumor-stem cell-associated antigens (CD-133+ 405 and 753 peptides) and infused to stimulate their own immune systems and induce cytotoxic T lymphocytes. The primary objective is to assess safety and tolerability of the compound. Using a vaccine, the initial randomized trial showed efficacy in patients with newly diagnosed GBM, and is the first vaccine to demonstrate increased survival. The current study is non-randomized, so that all participants receive active vaccine. WT2725 is comprised of peptides derived from Wilms Tumor gene product 1 (WT-1) – technically a synthetic protein – with potential immuno-modulating ability, and the WT2725 study tests WT2725 dosing emulsion in patients with advanced malignancies. The primary objectives are to assess safety and tolerability of WT2725 dosing emulsion and determine the maximum tolerated dose based on the evaluation of dose limiting toxicity. The majority of glioblastomas recur within approximately seven months after standard therapy. While the 2009 Food and Drug Administration’s approval of bevacizumab gave clinicians a useful option for treating recurrences of GBM, the drug was not shown to be effective as an up-front therapy. This research shows promise for up-front treatment, administered with initial standard therapy, to prevent recurrences of these life-threatening tumors. FELLOWSHIPS: Neuro-Oncology, National Institutes of Health, Bethesda, Md. ; Hematology/Oncology, University of Michigan Medical School, Ann Arbor, Mich.; Neuro-Oncology, University of Virginia Medical Center, Charlottesville, Va.
Stupp R, Mason WP, van den Bent MJ, Weller M, Fisher B, Taphoorn MJB et al. 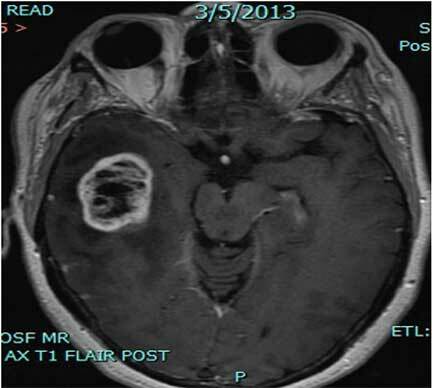 Radiotherapy plus Concomitant and Adjuvant Temozolomide for Glioblastoma. N Engl J Med 2005;352:987-996.
neuropathology-web.org/chapter7/chapter7bGliomas.html#gbm. Accessed February 2, 2015.
medscape.com/viewarticle/540150_2. Accessed February 2, 2015.
optune.com/therapy.aspx. Accessed February 27, 2015.